When I'm away from NYC, there's one variety of food that I always miss desperately: falafel, aka Middle Eastern, vegetarian cuisine. You know the eats: fluffy pita, creamy hummus, fresh chopped and tossed tabhouli, savory baba and spiced falafel balls - all drizzled in some delicious tahini sauce and perhaps some spicy chili or harissa sauce as well. I had never *truly* experienced falafel dining until moving to NYC - so this meal deserves a special spot in my Dining Out Vegan NYC Series. Sneak peek of Taim falafel below - many more pics and tips in my photo slideshow..
Newbies Read First - > Mid East Eats 101. To some folks, the menu at a Middle Eastern restaurant sounds like reading a menu from Mars. What's a falafel ball? And what in the world is baba ganouj (pronounce ba-bU gan-oosh). And doesn't all that white creamy tahini stuff contain dairy? Falafel: falafel balls are spiced balls, usually fried, sometimes baked - made from a base of ground chickpeas and/or fava beans. Wikipedia has a nice quip that "In Arab countries, the word is also used to describe something with a fluffy or crunchy texture". 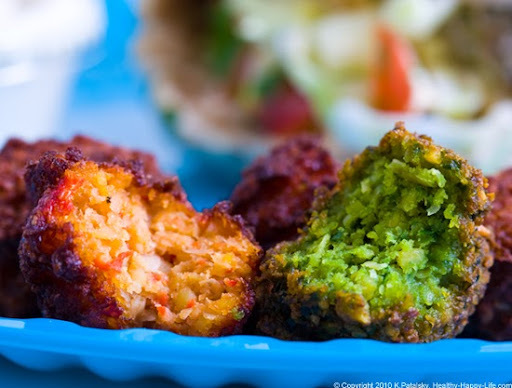 A good falafel ball will have a complex spice flavor. It should be moist and dense on the inside, with a crisp and almost fluffy/crunchy outer layer. A good falafel is lightly fried in a vegetable oil like canola oil. Some restaurants will bake falafel balls. I am not a fan of the baked falafel - however I am a fan of raw falafel balls when done correctly. Hummus: chickpea based spread with the consistency of a super creamy and dense applesauce. Ingredients usually include chickpeas, tahini and EVOO. Interesting quip, "In Arab countries, hummus is rarely added to falafel. Tahini thinned with water and lemon is more common." A good hummus will be complex in flavor - not flat. It should be smooth and creamy, while maintaining a hearty dense texture as well. Fresh hummus is light years better than packaged or store-bought hummus. Raw hummus is also a popular favorite of mine. Raw hummus sometimes contains an almond base. Tahini: creamy beige sauce made from ground sesame seeds. Used as a topping sauce for a falafel pita sandwich - similar to how you may use a thin salsa on a taco or burrito. Tahini sauces are usually a mixture of tahini paste, lemon juice, garlic, water and maybe some parsley as well. Tahini is tangy, slightly bitter and dense with the consistency similar to a sticky ranch or peanut dressing. Tahini may appear super creamy, but most of the time - is 100% dairy-free. Tahini paste has a bitter nutty flavor. Tahini sauce may include special ingredients, depending on the restaurant you visit. Tahini is usually drizzled over a large serving of hummus - like a hummus appetizer. Pita: Pita is a round pocket bread - it is sealed on all sides so that when sliced into halves, you can easily stuff it full of delicious ingredients like hummus, falafel, tabhouli, veggies and more. Pita bread usually comes in white or whole wheat. Good pita is fluffy and soft with a subtly spongy texture. Fresh pita bread should have a dusty outer surface. Warm oven toasted pita brad is my personal favorite. Sometimes pita is dusted with herbs and spices for a special touch. Tabouleh or Tabbouli or Tabhouli: Tabhouli is a salad made from finely chopped parsley, onion, lemon juice, pepper, bulgur or couscous, mint, EVOO and tomato. Sometimes extra herbs and spices are also added. Tabhouli can be eaten alone or added to a pita. Good Tabhouli should have a fresh and zesty flavor and be slightly crunchy - not mushy. Tabhouli is also incredibly healthy since it contains a high amount of the leafy green parsley. Spicy Sauce: From my experience, most falafel restaurants do *spicy sauce* their own unique way. Some prefer to do a green cilantro or chili sauce, others stick with a thin red sauce and some have a plethora of different spicy sauces and chutney-type spreads to choose from. A good spicy sauce is fresh and thin enough so that you can pour it right on top of your pita as needed. Baba Ganouj: Though it looks similar to hummus, baba is basically cooked and mashed eggplant with the addition of other veggies, spices and seasonings. Baba is creamy and sometimes smoky. Roasted eggplant is often used in baba. I personally hate eggplant - but I love baba, go figure. Baba is used on pita the same way hummus is. note: eggplant is also sometimes added to pitas or fried as a side dish. 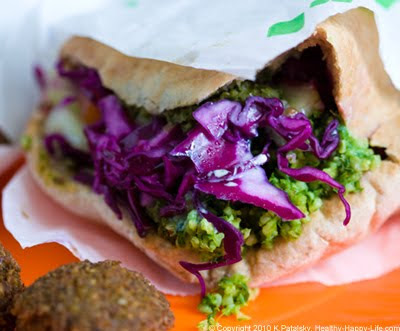 Other menu items: Stuffed Grape Leaves, Cabbage Slaw, Roasted Carrots, Beet Salad, Israeli Salad, French Fries (or Belgium Fries) and Baklava (usually not dairy-free) and often times several meat items - however ther are several all-veg falafel restaurants like Taim in nyc. Beverages are also a worthy consideration when choosing a restaurant. Some places serve fresh juices, lemonade, iced tea and smoothies. Soda and import sodas are often served as well. 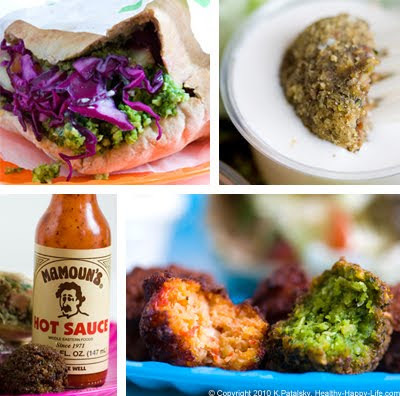 ...and be sure to click all the way through the slide show because I name my #1 favorite falafel spot on the last slide!